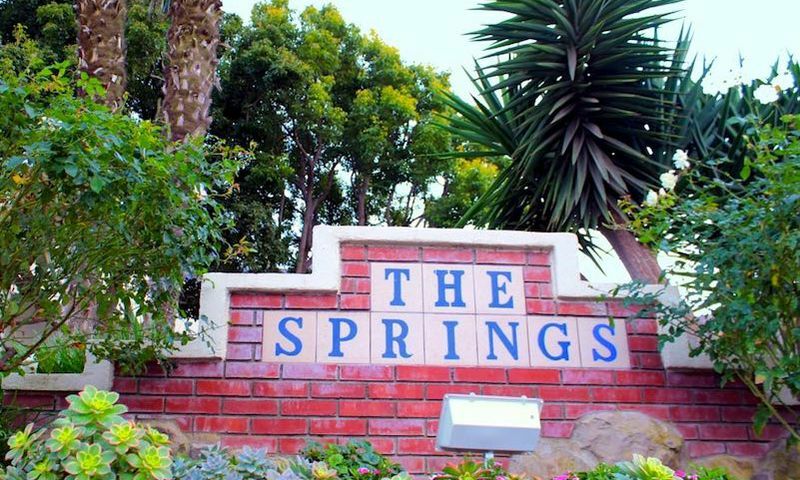 The Springs is an established 55+ community in Camarillo, California. This active adult community features affordable homes, a welcoming clubhouse, and a variety of social clubs and activities. Inside the gates, there are over 250 beautiful single-family homes. With its popular location in Ventura County, this active adult community is close to prime destinations, major airports and large shopping centers. Owning a low-maintenance home in The Springs means having the time to relax and enjoy moments with friends and family. The Springs offers its residents all of the amenities that one would expect in an active adult community. The athletically inclined can break a sweat in the exercise room while those who are more game-minded can enjoy the card room and billiards. There is also a ballroom, multi-purpose room and library within the welcoming clubhouse. Outside, residents can cool off in the outdoor pool or host a happy hour on the patio. The 18-Hole Camarillo Springs Golf Course provides exciting golf with breathtaking views. In addition, residents can enjoy the picnic area, R.V. parking and the walking and biking trails that wind throughout the community. Construction began in 1985 and in 1987 the community was completed with 259 single-family homes. The community is home to many different floor plans that offer approximately 1,211 to 1,690 square feet of living space. Homes typically have two bedrooms, two bathrooms and an attached two-car garage. To help energize your body, mind and spirit, this active adult community provides many amenities and activities. Residents who want to focus on socializing with neighbors enjoy attending events at the clubhouse, playing games in the card room, joining a book club, or traveling in the traveling springers group. Some other popular clubs include poker, Scrabble, Mah Jongg, golf, and line dancing. It's easy to get to know your neighbors in the tight-knit setting. The Springs is located in Camarillo, California at the base of the Conejo Mountains. This beautiful Ventura County community offers a peaceful setting amongst breathtaking views. Cut in and around the towering rock formations of the mountain, Camarillo Springs get its name from the beautiful water features of the golf course. The Springs is located near many recreational opportunities, shops, restaurants and medical facilities. Other popular destinations include Los Angeles and Santa Barbara, both of which are about 45 miles away from the community. Residents love that there is so much to do in and around this 55+ community in Ventura County, California. There are plenty of activities available in The Springs. Here is a sample of some of the clubs, activities and classes offered here. The Springs began construction in 1985 and in 1987 the community was completed with 259 single-family homes. The community is home to many different floor plans that offer approximately 1,211 to 1,690 square feet of living space. Homes typically have two bedrooms, two bathrooms and an attached two-car garage. Please Note: Floor plans are not available at this time. The place we bought here last spring needed a lot of work, mostly cosmetic like replacing all the carpet and painting. We also completely redid the master bath (it also had carpet) and had our kitchen cabinets painted. Everything turned out great and we love the location of this neighborhood. It's gated for privacy and the views are outstanding. We ended up spending more than we wanted but that always happens with real estate. 55places.com is not affiliated with the developer(s) or homeowners association of The Springs. The information you submit is distributed to a 55places.com Partner Agent, who is a licensed real estate agent. The information regarding The Springs has not been verified or approved by the developer or homeowners association. Please verify all information prior to purchasing. 55places.com is not responsible for any errors regarding the information displayed on this website.